The temporal pattern of pheromone emission by Anaphes listronoti females was established in a four-arm olfactometer by observing, at 2-hr intervals, the response of <2-hr-old males to odor produced by individual virgin females of <1, 1, and 2 days of age. This is the first evidence of a sexual pheromone in a Mymaridae. Under a 16L:8D photoperiod and 24°C constant temperature, the responsiveness of males to females of different ages varied significantly during the photophase. 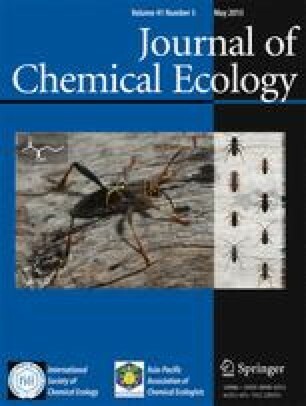 When <1-day-old females were used, males made significantly more final choices in the pheromone field than odorless fields at 4 and 6 hr after the onset of the photophase, and their walking speed was significantly higher from 4 to 12 hr, suggesting that females began to release a long-range pheromone during this period. Final choices and high walking speed were observed earlier with 1- and 2-day-old females than with <1-day-old females, and there was a significant decrease in male responses at 6 hr after the onset of the photophase, suggesting a bimodal temporal pattern of sexual pheromone emission.